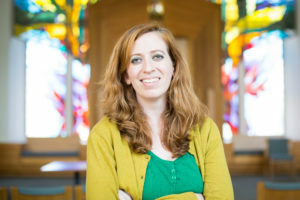 RABBI BRONWEN MULLIN, a Philadelphia native, received her BA in theater and religious studies from Sarah Lawrence College (2006) and her MA in Midrash and Rabbinic Ordination from The Jewish Theological Seminary of America (2017). She is a member of the Rabbinical Assembly of the Conservative Movement, and her organizational affiliations include The Conservative Yeshiva of Jerusalem, The Shalom Hartman Institute, The Open Center—Jerusalem, Encounter, The Jewish Dialogue Group, The Center for the Advancement of Jewish Education (CAJE), The National Center for the Encouragement of Judaism (NCEJ), The National Havurah Institute (NHI), SVARA- A Radically Traditional Yeshiva, Hadar’s Rising Song Institute, Art Kibbutz NY, and many others. While in rabbinical school R’Bronwen served as a hospice chaplain with the Metropolitan Jewish Hospice Service (MJHS) and has been a regular instructor in the Center for Pastoral Education at JTS on the intersections of artistic practice and spiritual healing. R’Bronwen is also the co-founder of Meta-Phys Ed, a multidisciplinary performance group wrestling with religious texts. As a composer/playwright, selected credits include: “Sensation/Cessation: 7 Movements for Sabbath (Drisha Arts Fellowship 2010); “The Seder of Serach Bat Asher” (Meta-Phys Ed at the Sixth Street Shul 2012); “CHALOM: A Dream Opera” (Hebrew/Aramaic, 2012 International Fringe Festival/FringeNYC); and “Bat Yiftach: A Tragic Punk Opera” (Meta-Phys Ed at The Jewish Theological Seminary June 2012, Art Kibbutz New York (2015), and the Kreischer Mansion (2016)). As a vocalist and multi-instrumentalist R’Bronwen channeled her passion for music as the High Holiday Cantor for Congregation Beth Mordecai in Perth Amboy, NJ from 2013-2016 in which she co-created both a traditional first-day service and an alternative musical 2nd day service. Judaism is R’Bronwen’s favorite art form, and she feels humbled to practice in this sacred craft. In the last 5 years R’Bronwen served as the first-ever appointed Rabbinic Artist-in-Residence at both the Jewish Theological Seminary and Town & Village Synagogue, creating diverse cultural events for and cultivating artistic community within the larger Jewish community. Popular programs R’Bronwen created include the Turning-it-Out Thursdays series (featuring Jewish musicians from around the world, film premieres and screenings, book readings and art installations), the Artists’ Beit Midrash (a collective of professional and non-professional artists learning Jewish texts that then inspire original performances and exhibitions), Drink, Drash, and Draw! (an initiative for 20s/30s community engagement featuring a contemporary artistic technique to be learned and custom-themed cocktails), and Prayer-for-the-People (a learners’ minyan geared towards creative engagement with traditional liturgy). R’Bronwen has served as a Jewish Educator for over 15 years working with learners ages 4-90 throughout the tri-state area. Whether it’s leading Shabbat services for campers at the 92nd Street Y or helping teenagers interview and collect the stories of local homebound seniors in their communities, R’Bronwen believes teaching and relationship-building is fundamental to her work as a rabbi. She has been a featured teacher focusing on the intersection of midrash/ classical Jewish commentary with contemporary performance and dramatic theory at the Jewish Theological Seminary, Birthright International, One Table, The Schechter Institute in Jerusalem, The Conservative Yeshiva in Jerusalem, The Academy of Jewish Religion in New York, Kehillat Romemu, The Sixth Street Shul, Limmud NY and Philly, Nehirim, National Havurah, Art Kibbutz New York (where she also served as Artistic Director), the JCC of Manhattan, the 14th Street Y, and Isabella Freedman Jewish Retreat Center. Perhaps R’Bronwen’s most meaningful work, however, has been as the Director for the Center for Conversion to Judaism in which she provided spiritual mentorship and Introduction to Judaism courses for over 50 individuals and couples. There is nothing R’Bronwen values more than supporting people to discover and live in their own Judaism. As for fun facts—R’Bronwen lives in Brooklyn, NY with her fiancée, Nicole. The legend goes that the couple got engaged in 2018 on the Shabbat of the Superbowl in which R’Bronwen’s beloved Eagles were victorious! This, of course, goes to show that miracles are possible 😉 In her “off-hours”, R’Bronwen enjoys running and hiking, but still maintains a healthy relationship with chocolate and Netflix. R’Bronwen looks forward to nourishing spiritual life at Congregation B’nai Jacob and being a part of the extended CBJ family!